3 Beds 2 Baths 2,508 Sq. ft. Description: Nestled on quiet country lot surrounded on two sides by pecan orchards. 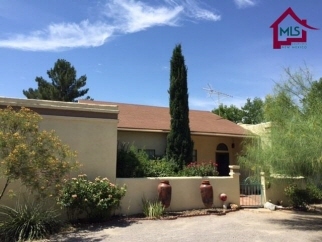 This charming home has been freshly repainted, new carpet, light fixtures & ceiling fans. Fully tiled floors except master bedroom. Nice tiled showers & tub surround. The property also offers a large fenced court yard, huge 4+ car detached garage with over head garage door & metal barn with over head garage door. Utilities include natural gas, community water, irrigation well & septic.